Everett, WA - The Everett AquaSox received the 2016-2017 Spirit of the Community Award from the Everett PTSA Council during their 2016-2017 Awards Recognition Banquet at Everett Community College on May 25, 2017. The AquaSox were recognized for their contributions to the students in the Everett School District. 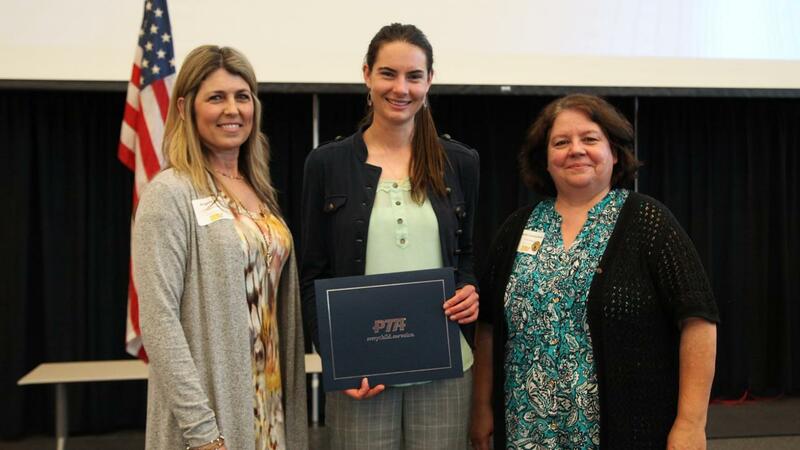 Kellie Howard, Community Relations & Merchandise Manager was on hand to accept the award for the organization from Everett PTSA Council President, Angela Steck and Program Chair, Denise Constantineau. "During my two years with the AquaSox I have had the privilege to kick off our Hit a Home Run in Reading Program and truly see the kids' eyes light up when they find out they can see an AquaSox game and Webbly all by reading books!" Kellie shared. Hit a Home Run in Reading Program presented by SoundTransit is a 4-week program that starts in the Spring months and in 2016 over 60 elementary schools and over 27,000 students in Snohomish County participated in this free program. The program kicks off at each school with a special appearance by Webbly and celebrates the reading program awards. In 2017 prizes included a student designed bookmark featuring artwork from four different students, free admission to the Woodland Park Zoo, a personal Alfy's Pizza, discounted Port of Subs kid's meal and a ticket to an AquaSox game with their school. Schools are invited to attend select games during our Opening Week where they are recognized during a pre-game on-field parade. Since 2009 over 200,000 students have participated in the 'Hit a Home Run Reading' program. General Manager, Danny Tetzlaff said "We are very honored to have our 'Hit A Home Run Reading' program recognized. Using AquaSox baseball to encourage student to read is a real homerun!" The first 'Hit a Home Run Reading' program Night is Opening Night June 15 against the Hillsboro Hops.